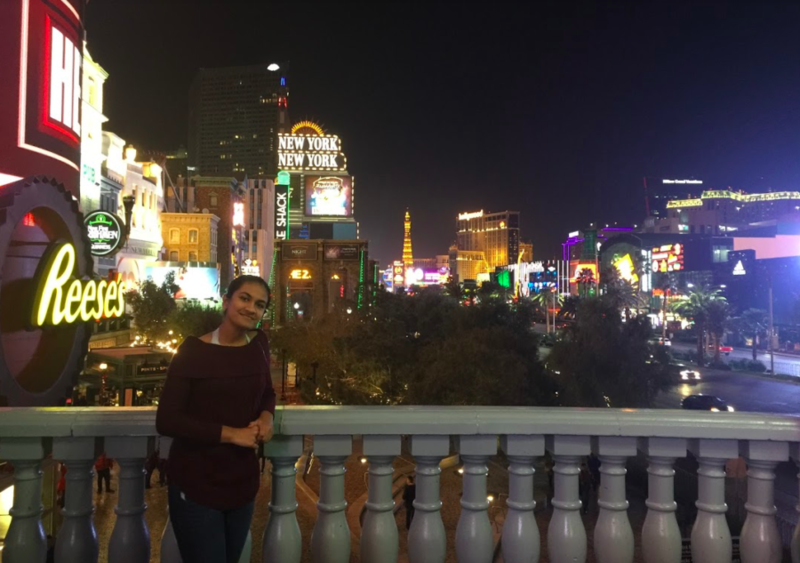 The Sidekick staff writer Anika Arutla talks about spending Christmas Day driving from Los Angeles to Las Vegas through the barren land and spending that night walking the Vegas Strip. She recalls seeing the holiday decorations at the hotels and watching the fountains in front of the Bellagio hotel. Living on the southern tip of the northeast for most of my life, I grew up in what is the ideal holiday atmosphere. Christmas Day, it would be below freezing, with a few exceptions, with a light layer of snow covering the ground like a blanket. However, as my family traveled more during the holidays, my perspective on the holidays changed. Most of my winter breaks were spent ice skating around a rink in the middle of Reston Town Center in my former Virginian hometown, drinking addicting Starbucks peppermint mochas and bundled up in my warmest winter sweaters and boots. When I moved to Charlotte, N.C., it was the same way. It was not the northeast, but it was close enough. The air was still cool and the people were still very much enthusiastic about the holidays. While I lived in Northern Virginia, we never actually spent the holidays in the city of Washington D.C. Living in a smaller city such as Charlotte, downtown was one of the only places to go. Even though it was not snowing, the fog that filled the city and the atmosphere itself brought out the spirit. That same year, my family drove to Florida for winter break. This would be the second time we spent the holidays in Florida. The first time was when I was 11 and we stayed in Orlando the entire time, jumping from one amusement park to another. In Orlando, the typical holiday feeling did not differ since we were surrounded by Christmas decorations and activities. The second time we went down to Florida, we were glued to the coast and the sunny Florida beaches. This was one of the first times I had spent Christmas wearing shorts and tanning, forgetting the fact it was even the holidays until there was an occasional Christmas tree. In fact, we spent Christmas Eve parasailing in the Florida Keys and Christmas Day driving up to Tampa. Last winter break, we went to California. This was my first time on the west coast as well as my second consecutive year without snow during the holidays. I had to admit that I had grown so accustomed to the cold that not feeling it threw the entire holiday season into turmoil. We spent Christmas Day driving through the California desert to Las Vegas and that night walking the Vegas Strip. The overwhelming amount of decorations and watching the fountains in front of the Bellagio hotel added a new meaning to holidays. In addition, when I was standing under Hogwarts at Universal Studios and the familiar Winter Ball music from the Harry Potter franchise started playing, I remember thinking there was no other place I wanted to be. It is estimated there is going to be a 3.1 percent increase in the amount of Americans traveling this year during Dec. 23 through Jan. 1. It is a great experience to be able to spend the holidays in different parts of the country and see their definition of the holidays. Nevertheless, I will be traveling back up to Northern Virginia soon for the holidays. I am excited to bundle up in my favorite sweater and boots as I watch the snow fall, going back to my definition of the holidays.